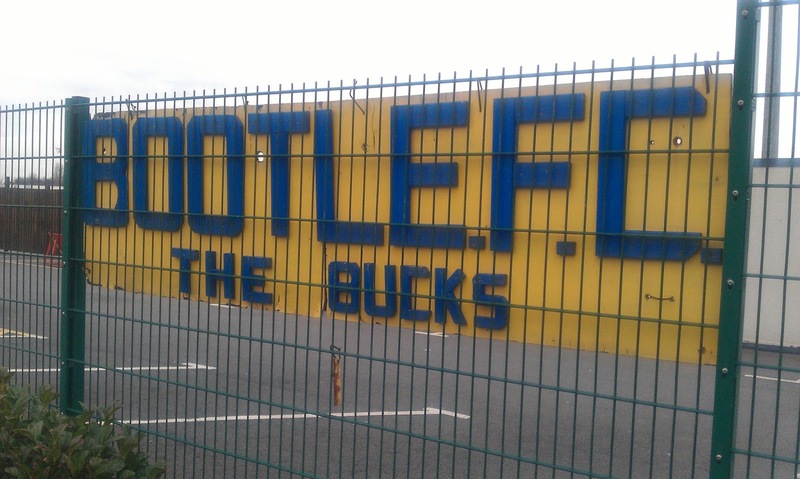 Though there is history of football in Bootle running back to 1879, the current club were founded in 1953 as LANGTON. 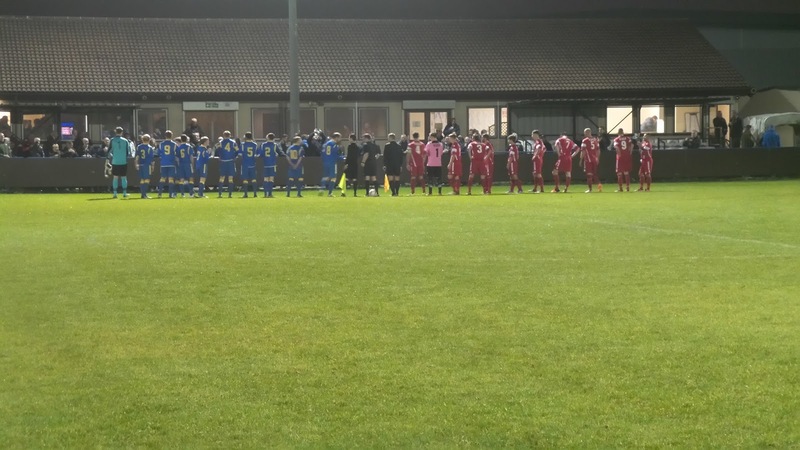 They played in local league for much of their history, having seeing great success in the Liverpool County Combination, which they won 6 times in a row. After moving to Lancashire and Cheshire leagues they became founder members of the North West Counties League in 1982. They reamained in it's top division until 1992 when they were relegated by a single goal, much to the relief of second-bottom Bradford Park Avenue. 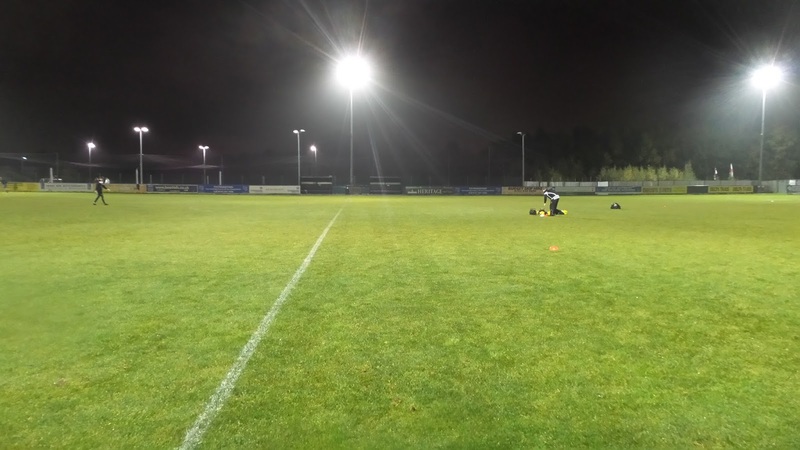 The bounceback was immediate however, winning promotion back up after finishing in a runners-up spot behind Maghull. Another relegation followed in 1997, again with an immediate return, but they only lasted 2 more seasons before once more being relegated. 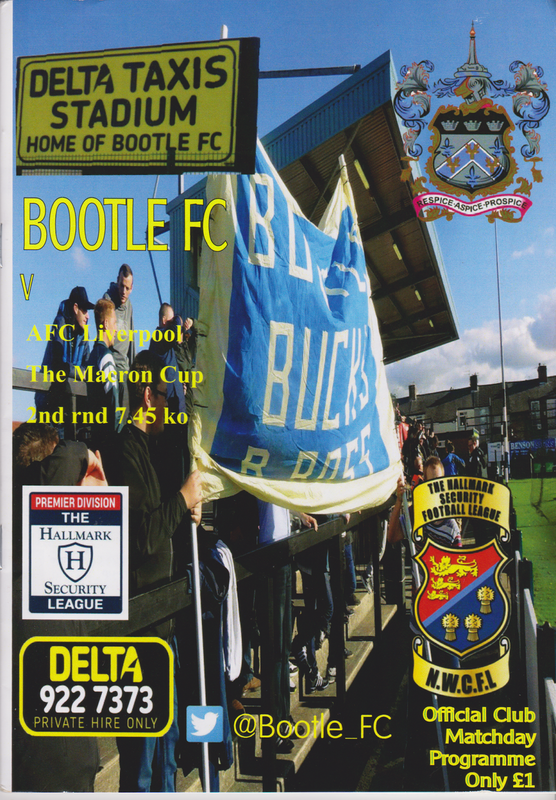 This time they did not recover though and the first part of the 21st century proved to be a difficult time for the club with Bootle dropping down to the Liverpool County Combination for 4 seasons. They returned to the North West Counties League in 2006, initially in it's second tier. The 2008/09 saw them go up as champions to the Premier Division, and they have remained there ever since. 2010, 2012 and 2013 were especially good years for the club, with them posting best-ever third-placed finishes in the league. 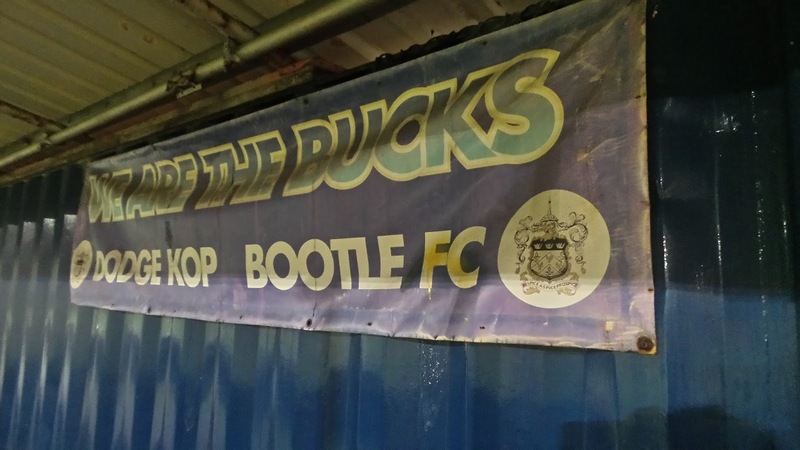 Bootle have done very well since returning to the top tier of the North West Counties, finishing in the top half every single season. This looks set to continue this season, with them sitting in 5th after last weekend's games. In the FA Cup, Bootle reached the 3rd Qualifying Round in 1990/91 where they lost 6-2 at Chorley after chalking up impressive wins against Winsford United, Ilkeston Town & Southport in previous rounds. The FA Trophy saw a run to the 2nd Round in 1980/81 before a defeat in a replay to Carshalton Athletic. In the FA Vase Bootle reached the 4th Round two seasons in a row in 2009 and 2010, only to be defeated by north-east opposition in the form of Whitley Bay and Norton & Stockton Ancients. Bootle had a fondness for replays in the mid 80's, taking 4 games to decide their FA Trophy 3rd Qualifying clash against South Liverpool in 1984/85 and FA Cup 2nd Qualifying Round encounter against Eastwood Town 2 seasons later. Locally the club lifted the Liverpool Senior Cup in 2013, beating AFC Liverpool 4-3 on penalties after a 1-1 draw on their own ground. Bootle has quite a number of famous people that were born there, including musician Billy J Kramer, plus TV's Derek Acorah and Keith Chegwin. It's speciality though is footballers with Jamie Carragher, Peter Cavanagh and Roy Evans being just a few to hail from the town. The ground is actually nearer to Aintree though, famous for its racecourse which hosts the Grand National and also the Aintree Iron, made famous by sixties pop group Scaffold in their song 'Thank U Very Much'. What the 'Aintree Iron' actually is, is a mystery with songwriter Mike McGear (Paul McCartney's brother) reluctant to explain. Explanations include a pub, Brian Epstein, a horseshoe, money, a urinal and a musical venue, but as yet no definitive answer has been found. I'd decided this game a week previously. I was up in Doncaster and Leeds for a weekend and with an early start on the Saturday, was keen to find a Friday night game. Initially my search drew a blank, but thankfully the North West Counties League game up trumps with a couple of Macron Cup games. 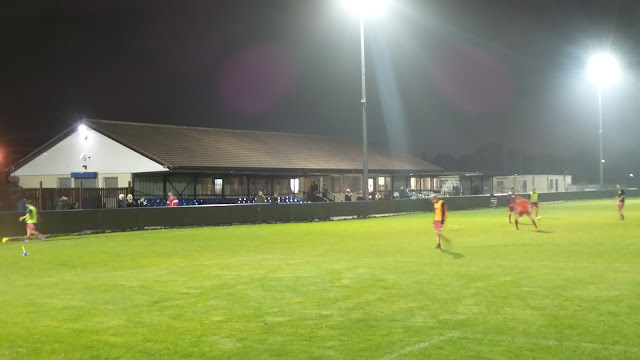 Widnes v Cheadle Town would have appealed normally, but it ended up getting moved to Barnton. There was also a game at Manchester City's academy ground, but in the end I opted for the local derby between Bootle and AFC Liverpool. Initially I'd booked a room in Bootle at the cost of £45, as it was the cheapest decent hotel I could find. However, I changed my mind and wanting to be nearer Leeds for the morning, looked on Air B&B for a room in Manchester, finding one with good reviews near the Trafford Centre for £17 a night. On the day of the game it was my last day at work for 9 days and it was really busy. I put my back into it and got my responsibilities done as quickly as possible. My boss asked me to stay, but with the motorways unreliable at the best of times, I was not going to risk staying any longer than I needed to. I got my stuff together, had lunch and left at 1.30. I was hoping for a good journey up but that turned out to be far from the case. I got stuck at the same two spots as I got stuck on on the way to Hereford the other week. There continued to be plenty of stoppages, not least on the M6 near Stoke which is one of the most pathetic bits of road in the country. The rest of that motorway was not much better and it was only when I left it that I started moving properly. I got to the ground at 6.45 after 2 hours 10 minutes delay, an utter disgrace considering motorists in this country are fleeced. I had to abandon any pre-match plans I had and go straight in the ground. 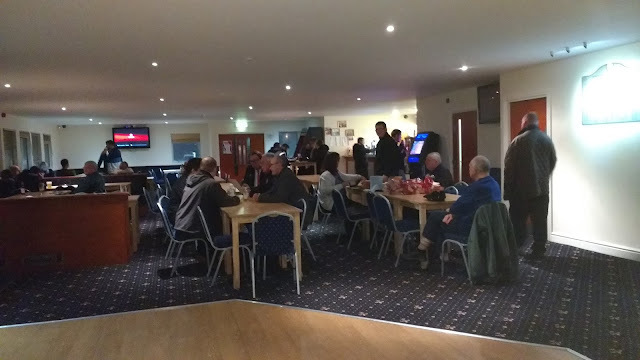 I paid £5 entry plus £1 each for a programme and a golden goal before going in the bar. There wasn't much for the cider drinker and I ended up having a bottle of Magners for £3.20. I caught up on Facebook and read the programme which was a pretty nice and glossy effort for £1. There wasn't a huge selection at the tea bar, but I enjoyed the burger that I had for £2.50. 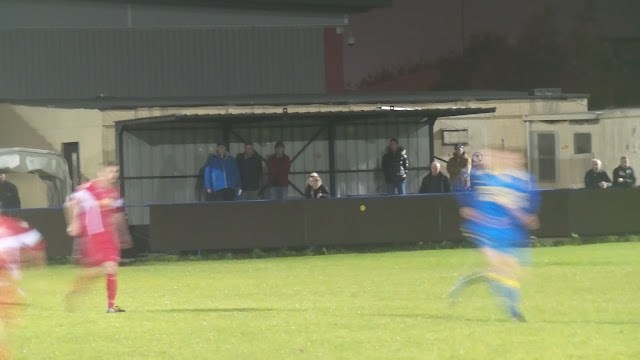 I stood on the halfway line and it was Ryan Cox who opened the scoring for Bootle on 15 minutes from close range following a good cross from the right-hand side. The hosts continued to have the better of the game and took their 1-0 lead into the break. 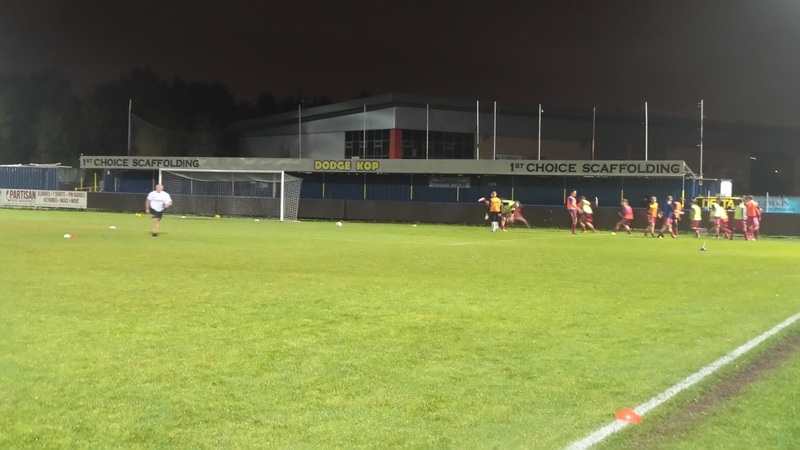 Though AFC Liverpool started the season half a bit better it was still Bootle on top and they extended their lead on 51 minutes with Daniel Murphy's low shot from the edge of the area. 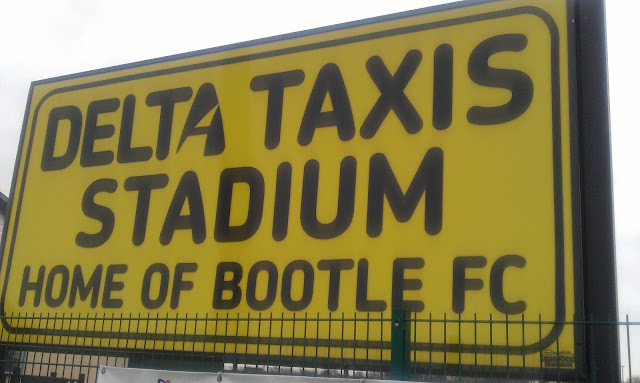 Bootle made sure of progressing to the next round just after the hour mark, although I missed the goal as I chose the wrong time to pop to the toilet. That's the way it stayed until the end, it was a well-deserved win for Bootle, but it was a shame AFC Liverpool didn't make more of a game of it. Near the end of the match I'd met fellow Groundhopper Graeme and we'd had a brief catch-up as the game entered it's final stages. After the game I set off for Manchester. I had to go to the Trafford Centre to pick up my key as the people that owned the house I was staying at were working till 1am. Air Bnb is something that I was initially reluctant to use, however after financial and geographical reasons forced me into using it, the couple were really friendly and the accommodation turned out to be comfortable and clean too. 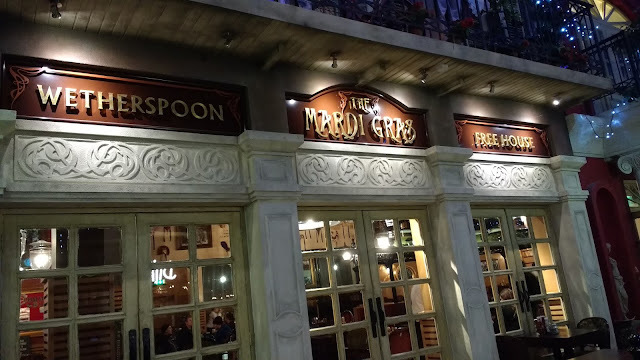 Before I drove back, I went for a pint of Apple Vice cider in the Trafford Centre Wetherspoons, my 115th in the chain. I then stopped at Asda on the way to my room and got some chicken, a couple of bottles of cider for tonight, plus a soft drink for the morning . I arrived at the house I was staying at 11.40 and it was strange letting myself into someone else's house. I had my chicken and some cider and watched YouTube in bed, before falling asleep just after 1am. 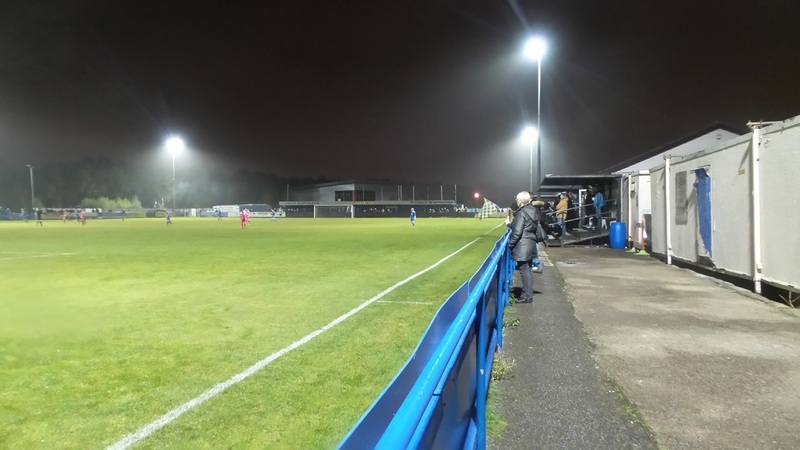 NEW BUCKS PARK is a fairly new ground, having been built around 2006. 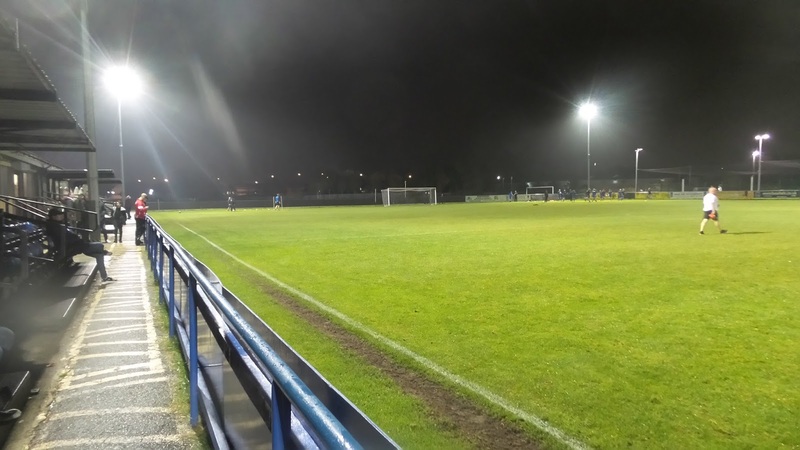 This allowed them to move back to the North West Counties League following the loss of their former ground and a period in the Liverpool County Combination where they played on basic pitches. It's not in the best location, being on an industrial estate, so there isn't a huge amount nearby. 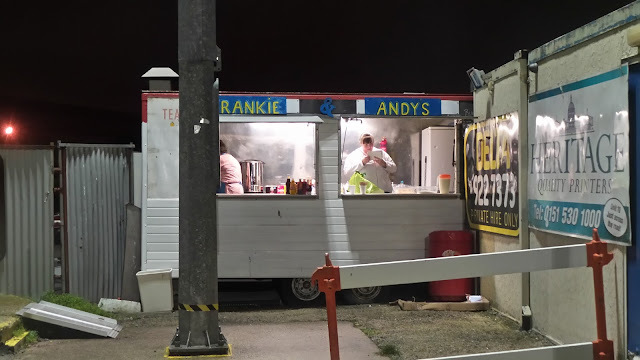 At the ground, there is a bar, which offers a fairly basic choice, and the same can be said of the tea bar which does burgers and the like. It does the job, but you might want to stop en-route if you want more substantial. 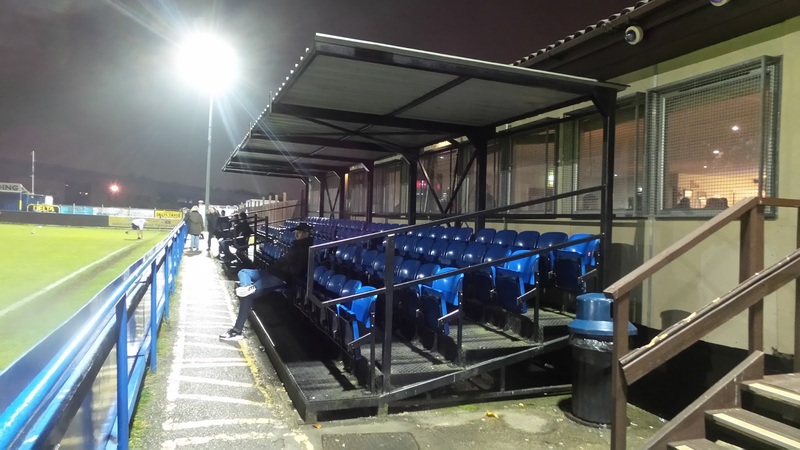 In terms of the ground, the main seated area is a metal arena type with a capacity of 200. There's a further covered terrace behind the goal called the Dodge Kop, and this could hold around 400. 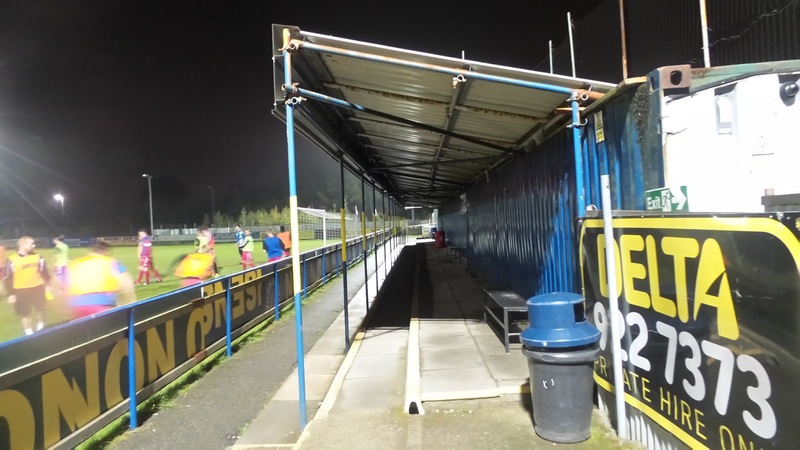 The rest of the ground is open hard standing.